The AWS::Greengrass::SubscriptionDefinition resource represents a subscription definition for AWS IoT Greengrass. Subscription definitions are used to organize your subscription definition versions. Subscription definitions can reference multiple subscription definition versions. All subscription definition versions must be associated with a subscription definition. Each subscription definition version can contain one or more subscriptions. When you create a subscription definition, you can optionally include an initial subscription definition version. To associate a subscription definition version later, create an AWS::Greengrass::SubscriptionDefinitionVersion resource and specify the ID of this subscription definition. After you create the subscription definition version that contains the subscriptions you want to deploy, you must add it to your group version. For more information, see AWS::Greengrass::Group. The subscription definition version to include when the subscription definition is created. A subscription definition version contains a list of subscription property types. To associate a subscription definition version after the subscription definition is created, create an AWS::Greengrass::SubscriptionDefinitionVersion resource and specify the ID of this subscription definition. When you pass the logical ID of an AWS::Greengrass::SubscriptionDefinition resource to the intrinsic Ref function, the function returns the ID of the subscription definition, such as 1234a5b6-78cd-901e-2fgh-3i45j6k178l9. The Amazon Resource Name (ARN) of the last SubscriptionDefinitionVersion that was added to the SubscriptionDefinition, such as arn:aws:greengrass:us-east-1:123456789012:/greengrass/definition/subscriptions/1234a5b6-78cd-901e-2fgh-3i45j6k178l9/versions/9876ac30-4bdb-4f9d-95af-b5fdb66be1a2. The ID of the SubscriptionDefinition, such as 1234a5b6-78cd-901e-2fgh-3i45j6k178l9. The ARN of the SubscriptionDefinition, such as arn:aws:greengrass:us-east-1:123456789012:/greengrass/definition/subscriptions/1234a5b6-78cd-901e-2fgh-3i45j6k178l9. The name of the SubscriptionDefinition, such as MySubscriptionDefinition. 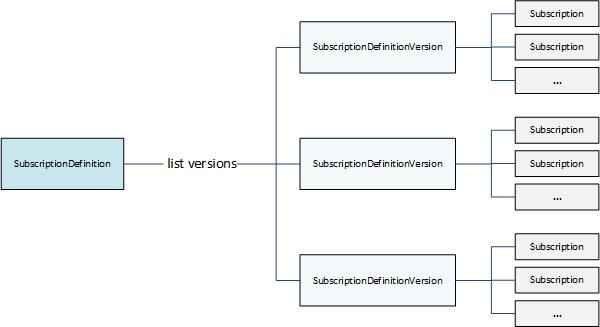 The following snippet defines a subscription definition resource with an initial version that contains a subscription. In this example, the subscription source is an existing device in the group. The target is a function in the group that was created in another stack (and referenced using the ImportValue function).